Maysville, MO……Frank Sherard, age 51, was born on October 23, 1964 to George and Florence Sherard in Cameron, MO. 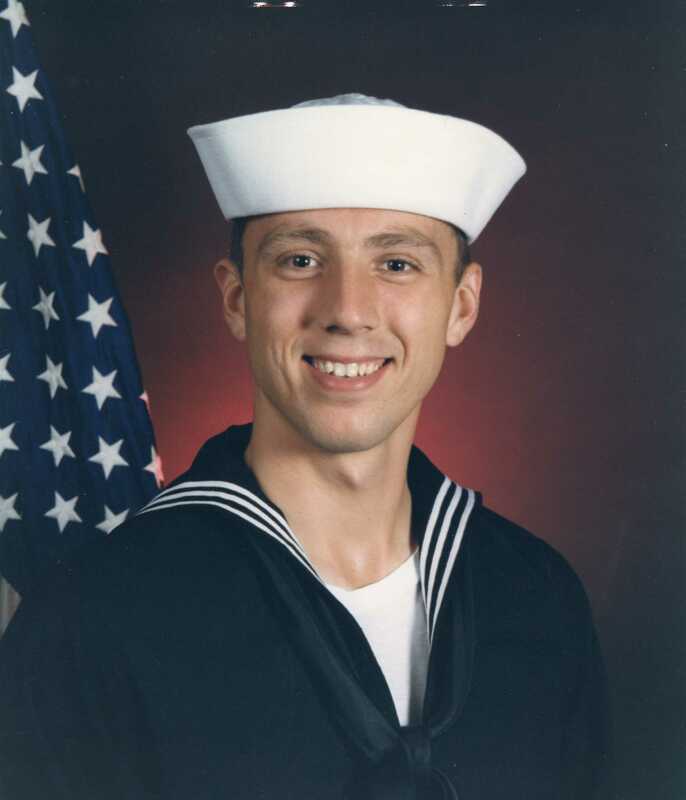 Chief Religious Program Specialist (Fleet Marine Force), Frank Sherard was a proud member of the US Navy having served with honor for nearly 30 years. During his time in the Navy RPC Sherard achieved the elite rank of Chief Petty Officer, served overseas in support of Operation Iraqi Freedom, and was the Senior Enlisted Advisor for 4th Marine Division’s Chaplain’s Office for 5 years during a mobilization to New Orleans. He was a member of the VFW and a true Navy man. Frank was a commissioned minister in the Great River Region of the Christian Church (Disciples of Christ). At the time of his death he was serving Jerusalem Christian Church (Disciples of Christ) in Lafayette, LA, a church he founded with his wife. Frank was Texas Christian University’s greatest fan, having graduated from the University in 1993. On January 6, 2007 he made Ashley Smith the happiest woman in the world when they joined in marriage in Leavenworth, KS. To this covenant three beautiful daughters were born. He was a loving and supportive husband, dedicated father, loving brother, and dear friend. He was preceded in death by his parents; two nieces, Sherilyn Ann and Etta Mae Lathrop, and nephew, Kevin Douglas Duce. He is survived by his wife Ashley of Lafayette, LA; daughters, Lennon Katrina, McCartney Michelle, and Harrison Nicole, of Lafayette, LA; sister Katherine (Duane) Duce, Liberty, MO; brother Gary (Dan) Sherard of North Kansas City. Ashley, I’m so very sorry to hear of your loss. I am very familiar with the walk you are beginning. I pray God’s richest comfort and compassion for you, as well as His strength and peace in the days and months ahead. God is faithful! Please call me any time you want to talk. In the Love of Christ, Cheryl Roach. Thank you, Frank Sherard, for leading my two children into baptism when they were teenagers. Thank you for speaking at my husband’s funeral. Thank you for being a friend. Rest in peace. Ashley, I do not know you, but my sincere sympathies to you and your daughters. May you live in peace. Thank you so much, Susan. I have heard Frank mention your name and always enjoyed hearing his fond memories of Stanberry. To the entire Sherard family, I am so sorry and heartbroken to hear this news. Frank was one of my very dearest friends in college at TCU. He walked me through two of my toughest years when my brother took his own life and for that, I have been forever grateful. He always made me laugh and even at the age of 19, I could tell he was going to be a great minister. He definitely had the gift, even at a young age. I am sorry that I never got to meet you, Ashley, but just know I have been and will continue to pray for you and your sweet girls in the coming days and months ahead. May God’s warm embrace provide you peace and strength. I hope we can meet someday, he was very fond of you….spoke very highly of you. Thank you fot holding us close. This is my darkest hour. Ashley, the Regional Elders are all keeping you close to our hearts during this time. May you be sustained by the wonderful memories. Blessings for strength as you move forward. The essential elements of true brotherhood are love, charity and esteem. Love that binds our hearts with the sturdy chords of fraternal affection; charity that is impulsive to see virtues in a brother and slow to reprove his faults; esteem that is respectful to the honest convictions of others and that refrains from treading upon that which is sacred to the spirit and conscience. Rest in peace Frater Sherard. I am heartbroken that Frank is gone too soon. I miss seeing him at our church. I miss his cheerfulness and tender spirit. I continue to pray for Ashley and the girls. I know he loved all of you so much. Thank you Ms. Carol. He loved ya’ll. Thanks for the prayers. There are special people in our lives who never leave us…. Even after they are gone…… Frank was one of those people. He will forever be in the hearts of the members of First Presbyterian Church, Lafayette, Louisiana. May he rest in peace. Thank you for your continued care and concern Ms. Linda, you’ve been a blessing. I went to TCU with Frank. He was one of the truest, kindest people I have had the honor to have known. Sending prayers of comfort. Words cannot convey my sorrow for you and for your children. You are constantly in my thoughts and prayers, as well as the thoughts and prayers of many of us at FPC. We grieve with you, and we miss Frank – our friend and colleague. We stand ready to support you if called upon. Your clergy coffee friends are also holding you up in prayer. We love you, and we pray that the Christ of God will offer you peace, that the Holy Spirit of God sustain you, and that the Creator of all that is give you the strength needed in this terrible time. My heart is sad my heart is sad but we will always remember him fondly!! My hope is that the memories of Frank will sustain Ashley and the girls. I knew Frank from TCU and never remember him without a smile and a laugh. He was a very sensitive, caring, and warm person, and a lot of fun to be around. He had a wonderful heart and always was wanting to help. May he rest in peace and may all of you be comforted in knowing he was a great friend and a wonderful man, and that he loved you all very much. He was my heart, still is, always will be. Thank you for reaching out, his days and friends at TCU remained so very dear to him even to his last day. The RP community grieves with you. Frank is well-known and well-respected among the Chaplains and Religious Program Specialists he has served along side of, not to mention the many, many Marines and Sailors he was passionate to serve. Our prayers and thoughts of comfort are with you and your three children. Thank you, he was so proud to serve the Navy and the Chaplains and RP’s. You all were his family and I am sorry for the loss to the Mess, the Navy, the Marines, and the Chaplains. Our hearts are heavy and the sun does not shine as bright. Frank will be missed by the world. Ashley, you and the girls are constantly on our minds and in our hearts and prayers. We are here for all of you. Love you Matt! Thank you for being such an amazing part of our lives. The girls find much comfort in knowing their Lafayette grandparents will be there when they come home. He always looked forward to seeing you on Mondays, you were a part of his FPC crew. He loved you all dearly. Ashley – I know that your girls and you were the center of Frank’s universe; he was taken much too soon from your lives. We cherished him at First Presbyterian, and I will dearly miss his beaming smile and generous spirit. May God hold you in the palm of his hand, and wipe your tears away. Thank you Marilyn. He was just too special for this world, I guess. He loved you all dearly. I will always remember “Frankie” from high school! He had such a warm, and witty sense of humor! And never in a way that would cause someone pain! I found it a blessing to reestablish contact with him on social media… And even greater treasure was late night phone calls celebrating who we were in Christ! Frank had filled a void I had recently by taking a Pastoral role in a couple of issues.. Although we had not sat face to face in nearly 35 years.. I still loved him as my friend! Peace and Mercy to you his family, and may his memory extinguish the pain of his loss! Thank you Scott, he was a truly special person. I served with Chief Sherard in NOLA from 2008 to 2011 and he was one of the best leaders I had while I was there. He would always make time to guide and take care of his junior Saikors and Marines regardless of what he had going on. Such a great man, husband, and father. I am truly sorry for your loss, Sherard family. I didn’t know Frank very long, but he always had a place in my heart. RIP dear friend. I will be keeping you and your family in my thoughts and prayers Ashley. I went to school with Frank and he is one of my all time favorite people. Frank was a huge help to me a few years back. I had a young Navy Officer on a ship in the middle of no where, we needed to get him home and Frank was a HUGE help with that whole process. He was a very special man, he was deeply loved and he will be greatly missed. My heart goes out to you and your family. Thank you Lori, it’s so comforting to be surrounded by all of these stories of how he impacted others lives. Thank you Fran! We are just heartbroken.